Article Courtesy: wunderground.com | By: Dr. Jeff Masters | Originally published: January 22, 2019 | Please click here for original article. 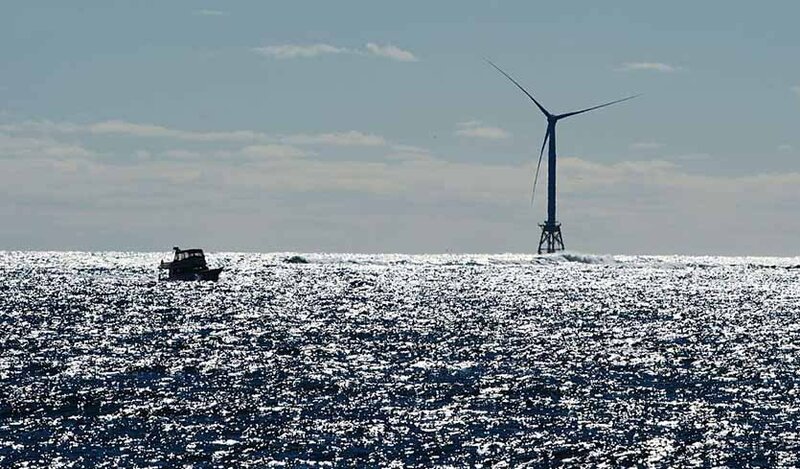 At last month’s American Geophysical Union (AGU) meeting in Washington D.C., Talya ten Brink of the University of Rhode Island presented the results of a study of 25 commercial and recreational fishers who fished near America’s first offshore wind farm. Her preliminary analysis showed mixed attitudes towards the turbines. On the positive side, most of the fishermen noted that the structures acted as an artificial reef, providing more habitat for fish and increasing the fishing opportunities. On the negative side, commercial fishermen cited the loss of the fishing grounds near the wind farm during the construction period as being a problem, as well as overcrowding of the area afterwards due to the increased recreational fishing occurring. However, some commercial charter fishermen reported that they had a new revenue source by offering wind farm tours. Figure 1. Damaged wind turbines in the Punta Lima wind farm after Hurricane Maria in Naguabo, Puerto Rico on October 2, 2017. Image credit: Ricardo Arduengo/AFP/Getty Images. Figure 2. 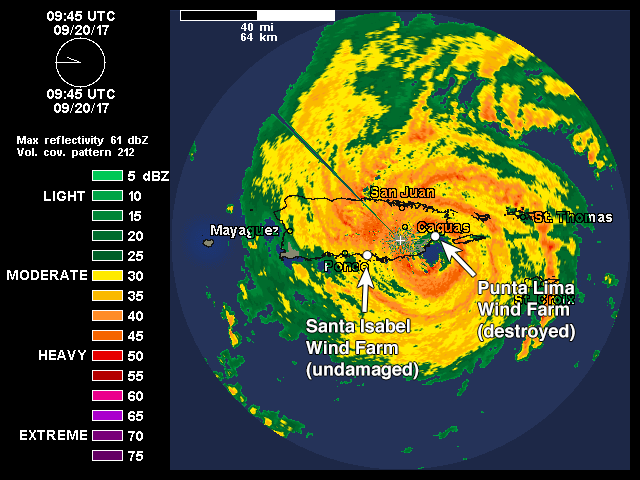 The last radar image of Maria from the NWS Puerto Rico radar before it failed, taken at 5:45 am EDT September 20, 2017. Maria officially made landfall 30 minutes later at 6:15 am EDT, when the center of the eye crossed the coast. The location of the two wind farms on the island is shown. Currently, most wind turbines are required to be engineered for sustained winds of 112 mph (10-minute average) and peak 3-second gusts of 156 mph (a standard called IEC 61400-01). These are the winds of a Category 3 hurricane. The turbines of the Block Island Wind Farm have had one decent test of their engineering: during the March 2017 Winter Storm Stella, winds in the storm peaked at 53 mph at the nearby Buzzard’s Bay buoy, which suggests that the turbine blades experienced winds of 65 – 70 mph—just below Category 1 hurricane strength. The turbines functioned as designed, automatically cutting out when the wind speed reached 55 mph, and resuming production several hours later when the speed fell below the 55 mph cut-off threshold. The structures that hold the wind turbines to the sea floor are built to withstand wave heights of 60 feet, characteristic of a 1-in-1000-year storm, and the waves of Stella were far below that threshold. A more serious test of two near-shore wind farms came during Hurricane Maria in Puerto Rico in September 2017. The hurricane made landfall on the southeast coast of the island as a top-end Category 4 storm with 155 mph winds. The stronger right eyewall of the hurricane passed directly over the 13-turbine Punta Lima Wind Farm. All 13 turbines suffered significant damage, with blades snapped off; one of the towers snapped in half. Negotiations are under wayto replace the 13 turbines at a cost of $50 million. 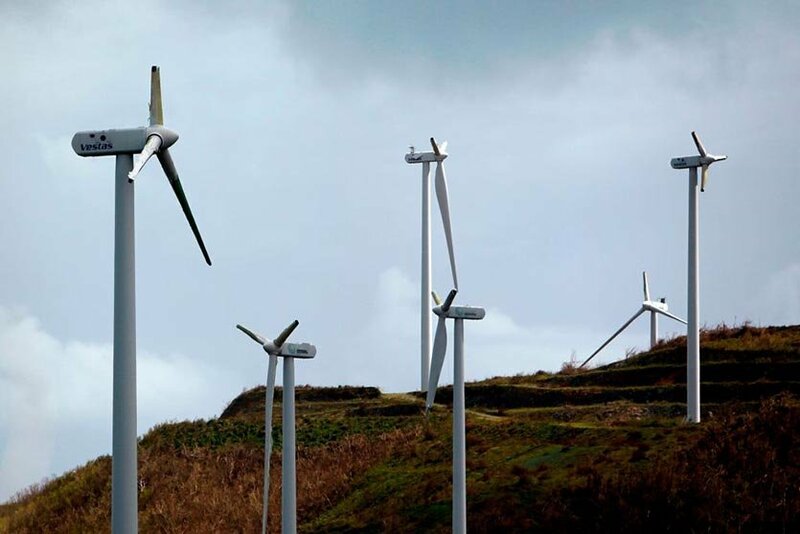 The largest wind farm in the Caribbean, the 44-turbine Santa Isabel Wind Farm, did not sustain any significant damage from Maria, though. This site was located on the south-central coast of Puerto Rico, on the weaker (left) side of Maria, and missed getting the eyewall. 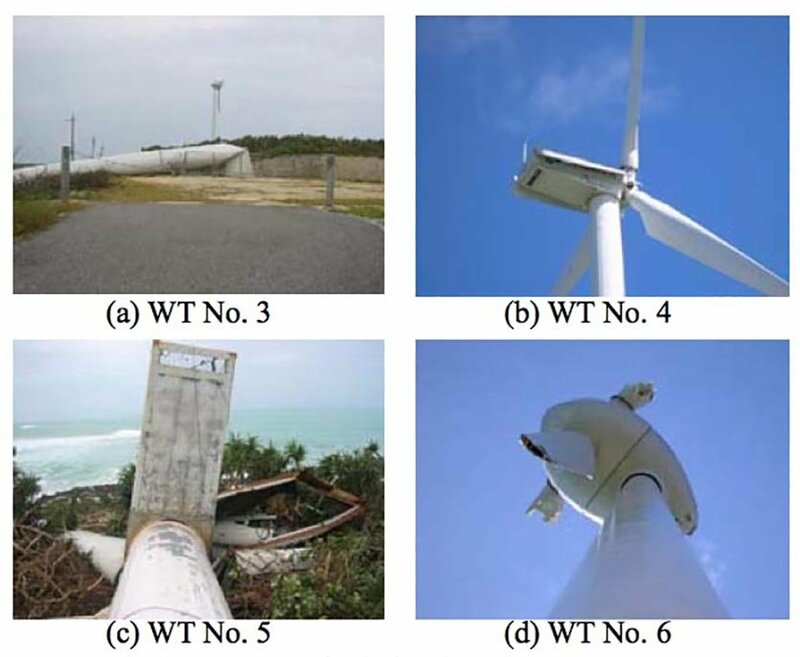 According to the HWRF model, the Santa Isabel Wind Farm likely experienced sustained winds of at least Category 1 strength, and possibly Category 2 strength (up to 110 mph), so this was a significant test of the turbines’ engineering limits. With more offshore wind farms planned for hurricane-prone U.S. waters, the expected lifetime of a wind farm of 20 years means there is a significant chance that some of these facilities will experience winds beyond their design limits. Even the waters of New England are prone to the occasional mid-strength Category 3 hurricane with winds near the current design limit. There have been three Category 3 hurricanes to make landfall in New England in the past 100 years: the “Long Island Express” storm of 1938, Hurricane Gloria of 1985 and Hurricane Carol of 1954. Thus, a higher engineering standard is a good idea, and a new standard has been proposed for typhoon/hurricane resilient turbines, called subclass T, which will soon appear in IEC 61400?1 edition 4. Virtually all utility-scale wind turbines today have their blades facing upwind. However, a rotor being developed by Wetxel Engineering has its blades facing downwind, allowing wind to blow the blades away from the tower. This allows the blades to be more flexible, and permits them to bend in high winds without the risk of them hitting the tower, thereby reducing the risk of structural damage during a hurricane. This sort of advanced design is a promising possibility for offshore and near-shore wind farms that may experience eyewall winds of a mid-strength Category 3 or stronger hurricane.